Our series of tips to help you leverage the power of design and creativity to grow your business. This week: 03. Don’t be pitchy! Designers are in general a happy, easy going bunch. There’s just one thing that tends to get us all a little hot under the collar. The free pitch. 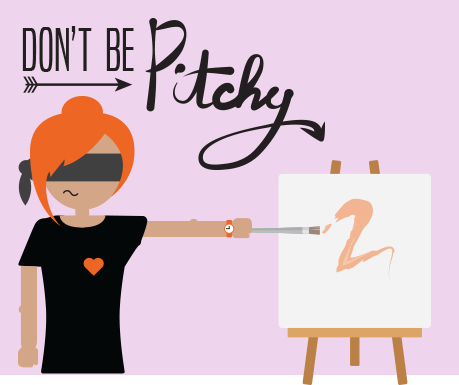 To those who don’t know (and we like it that you don’t know) a creative pitch is where a client will ask a selection of designer agencies to present creative ideas to tackle the problem they want their project to solve. Good clients expect to pay for this. Bad clients don’t. That’s a free pitch. Think of it like eating in 3 really good restaurants and then deciding which one you’re going to pay at the end. Only less scientific than that. Sure, some designers will willingly do it – but that’s generally because they are desperate for the work. And you really have to ask why that is. But the free pitch is a flawed strategy – for everyone. At the outset of a project the brief usually isn’t accurate – that’s not anyone’s fault but good designers add to a brief and suggest better approaches to solve problems. Good designers and good clients collaborate to shape briefs. So why then, ask 3 people, sometimes without even meeting them, to produce a creative answer to the wrong question? Sure they might hit the nail on the head but would you entrust the direction of your business on a third party without fully assessing their problem solving ability on their previous projects? Next week: 04. Show us the money!